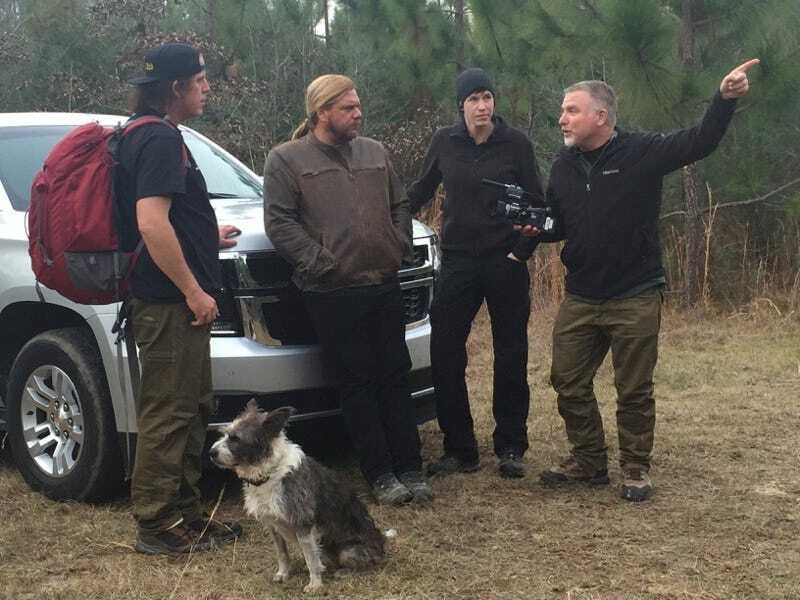 From left: James “Bobo” Fay, Matt Moneymaker, Ranae Holland, and Cliff Barackman confer on this week’s episode of Finding Bigfoot. All photos courtesy of Animal Planet. Finding Bigfoot is one of Animal Planet’s most popular shows. It’s been on the air for five years and has clocked nearly 100 episodes, none of which—despite the sheer amount of cameras involved—feature any footage of the elusive giant ape. So when we talked to the show’s hosts, we had to ask them what’s the hold-up. The tantalizing possibility that this week, Bigfoot might actually show up, is essential to the show’s enduring appeal. Each episode follows a predictable formula, but the scenery is always killer (if Bigfoots do exist, they definitely hang out in some of the most gorgeous and untouched places), and the tone is charmingly earnest. That last factor is due to the personalities involved. Along with biologist Ranae Holland, the group’s resident skeptic, and field “caller” James “Bobo” Fay, who provides the show’s comic relief, Finding Bigfoot’s core cast consists of researcher Cliff Barackman and Matt Moneymaker, founder of the Bigfoot Field Researchers Organization. Barackman and Moneymaker are true believers. Barackman told io9 that he estimates there are “maybe 10,000 individuals, give or take a few thousand” living in small family groups across North America. Individual Bigfoots, that is. The obvious next question, of course: If there are 10,000 of these creatures roaming around out there, why have they been so elusive for so long? So ... if you’re out hiking or camping in some unspoiled North American wilderness, and you stumble across a Sasquatch, what should you do? Moneymaker agreed that’s what you should do afterwards, but he also offered some tips for how to react in the moment. “If you’re not prepared for it, it can be terrifying,” he says. “If you happen to have a camera in your hand already, then try to take a photo of it or a video. If it’s in your bag, I’m telling you—if you see one, you’re not going to try to reach into your bag. Here’s this precious view of this thing you’ve been trying to find for a long time, and that’s a powerful moment. Finding Bigfoot airs Thursday nights on Animal Planet.